One of my favorite hikes is a combination of the Cherry Run and White Gold Circuit hikes, described as hikes nos. 27 and 29 in “Hiking the Endless Mountains”. This route follows the eastern part of the Cherry Run hike, and the western part of the White Gold Circuit hike. 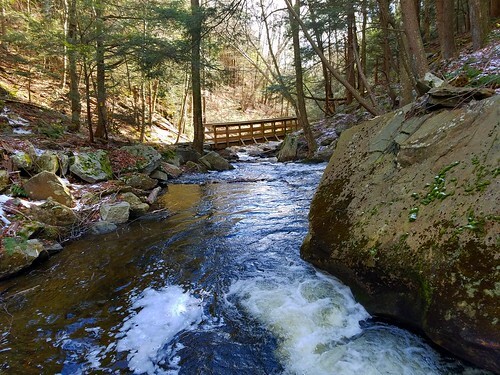 This loop has it all- views, hemlock forests, cascades, streams, ponds and some history. It is also moderate in difficulty and about 7-8 miles in length. I parked at The Meadows along Mountain Springs Road and entered the woods on the unblazed, unsigned Hall of Hemlocks trail. The trail follows an old grade along the edge of the plateau, passing small streams and deep hemlock forests with ground pine. It is very scenic. The trail gets closer to the edge of the plateau with rock outcrops and partial views. The trail moved away from the edge and climbed into a hardwood forest, this section can be a little hard to follow if there is snow or leaves on the ground. It is likely easier to follow in summer. 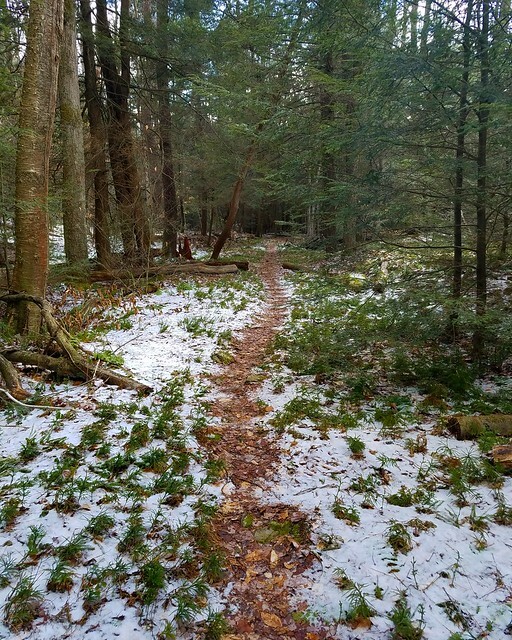 I followed the trail back to the edge with more hemlocks and a small stream with a trickling falls. The hemlocks continued as I descended to beautiful Cherry Run with its cascades. Without a bridge, I made my way across the water using rocks. I soon reached the yellow blazed Little Cherry Run Trail in Ricketts Glen State Park, where I turned left. This is a gorgeous trail with two bridges as it closely follows Cherry Run with all its rapids and cascades in a narrow gorge. It looks like this trail is becoming quite popular. There is a large rock outcrop, pool and small falls at the bottom of the trail. I then turned left on the red blazed Mountain Springs Trail, which followed an old forest road and also doubles as a snowmobile trail. This was another scenic forest walk with more hemlocks, birch, and maple. I could hear Bowmans Creek flow below. I reached the end of Mountain Springs Lake, following the trail to the left. The lake has been officially drained, but when enough water flows in, it does fill back up. I was lucky to see the lake full once again. The trail went along the north shore of the lake with many nice views. I reached the end of the lake and passed the dam, heading straight on the dirt road. Old foundations for the ice industry were to the right. I turned right, or straight onto an old grade where the dirt road turns left. This obvious grade headed east, passing on the north shore of the wetlands of what once were Ice Dam No. 1. I had not hiked this trail before and I enjoyed it. Bowmans Creek meandered within this wetland with many beaver dams. I reached the end of the wetlands at the remnants of the dam and deep meandering pools. I turned left onto an old forest road and climbed up to the dirt road. This was now a part of the White Gold Circuit. I crossed the road and followed an obvious trail up a gradual slope back to the plateau. As I neared the top, huge boulders and ledges rose above me. This is a beautiful trail. The trail kept close to the edge with views through the trees. The views opened up from cliffs and ledges of the lake and the streams that roared below. This is a nice place for a sunset. The trail left the cliffs, meandering through woodlands, and reached Beech Lake Road. I turned left on the road, took the grassy grade on the right out to Beech Lake to see some ducks and geese. To my surprise, there was no ice on the lake, which reflected the blue skies and white clouds. I retraced my steps and returned to my car. If you’re looking for a new place to hike, I highly recommend this superb loop. While all trails are not blazed or signed, all trails and grades are well established and this loop is fairly easy to navigate. On the drive home, I stopped by the Hayfields in Ricketts Glen State Park. I never really hiked here, so I explored the meadows and wetlands, and enjoyed a sunset in the frigid breeze. I also stopped by the former site of the lumber town of Ricketts, once home to 800 people, but now replaced by forest. It is amazing all the lives that have come and gone in a place that is now so isolated. Hiking this loop is easy, it is about 7-8 miles long. Terrain is moderate with gradual inclines and declines. 4. The trail moves closer to the edge of the plateau. 5. Leave the hemlocks and enter a hardwood forest. Trail may be a little harder to follow through here, especially if there is snow or leaf cover, but it is discernable. 6. Trail moves away from the edge of the plateau, going off and then onto an old grade. 7. Trail moves closer to the edge of the plateau with more hemlocks. 9. Enjoy more hemlocks above Cherry Run and descend. 11. Hike the trail down along Cherry Run, very scenic. 12. Turn left onto the red blazed Mountain Springs Trail. 13. Hike to Mountain Springs Lake, walk to the dam and parking area. 14. Continue straight on dirt road. Ice industry ruins on right. 15. Where dirt road turns left and climbs, continue straight onto obvious old forest road. 16. Hike above the wetlands of former Ice Dam No. 1. 18. Cross dirt road and follow obvious footpath as it goes through pickers and up an old grade. 20. Trail turns right and climbs, levels below cliffs and ledges. 24. Retrace your steps and return to your car, which is nearby.